Very old 200 Megabyte drive NOT Gigabyte. Drive is 1.6 inches tall. Clean and tested good with no bad spots. Listing is for 1 drive each at this price. Picture is stock picture and you will NOT receive the actual drive shown. No trays are included all drives are bare drives. They are used and may have some wear & scratches normal for their age. Drives are Completely Blank and will need to be Partitioned and Formatted BEFORE they will be seen by a computer's operating system as a valid drive letter. 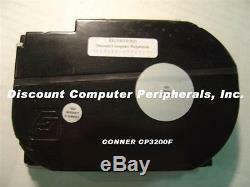 The item "CONNER CP3200F 200MB 3.5IN SCSI 50PIN Hard Drive 12 instock Tested Free USA Ship" is in sale since Wednesday, August 23, 2017. This item is in the category "Computers/Tablets & Networking\Drives, Storage & Blank Media\Hard Drives (HDD, SSD & NAS)\Internal Hard Disk Drives". The seller is "our_drives_work" and is located in Malabar, Florida. This item can be shipped worldwide.